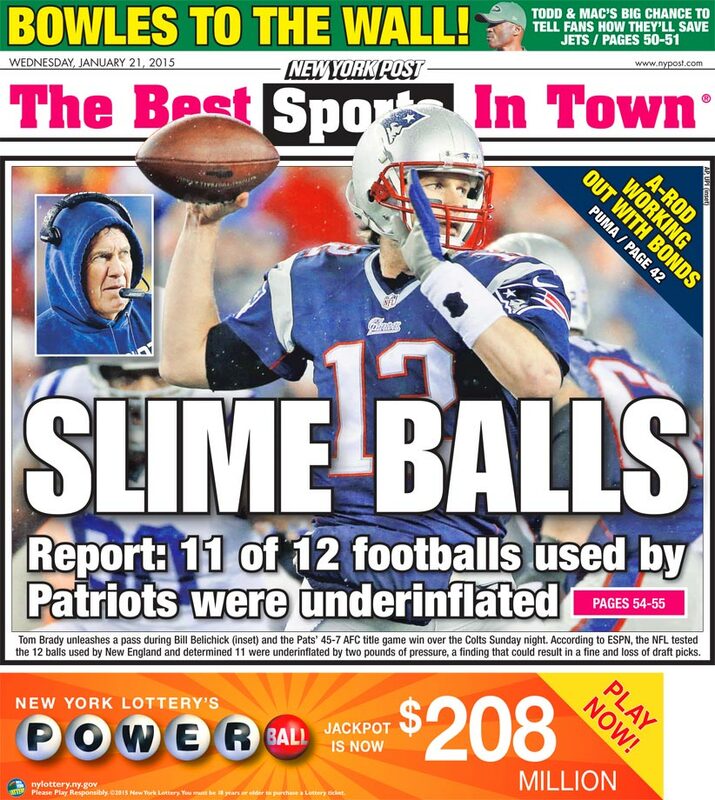 You think the New York City tabloids are having fun with the Deflategate controversy? Oh, you bet they are. 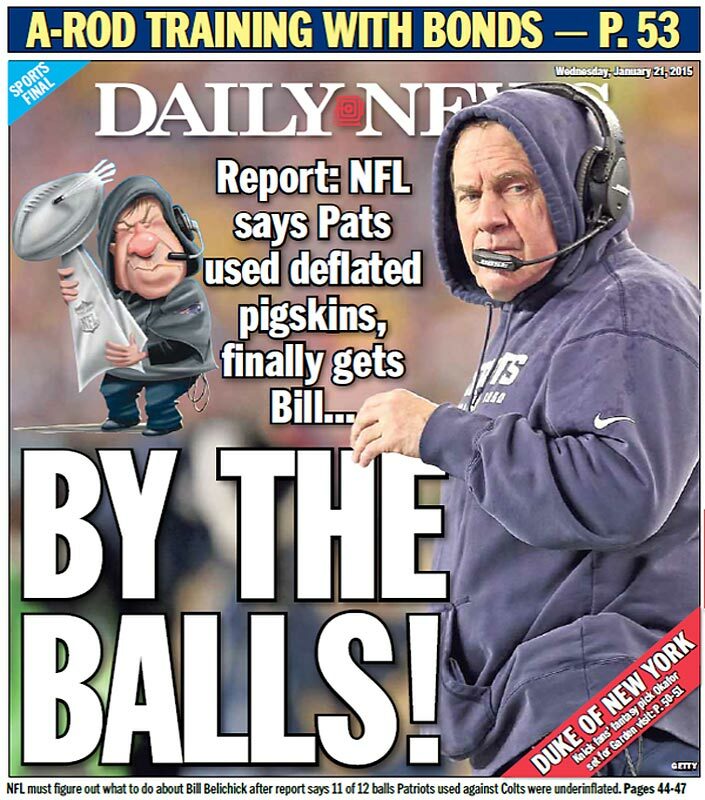 You think the New York City tabloids are having fun with the Deflategate controversy? Oh, you bet they are. 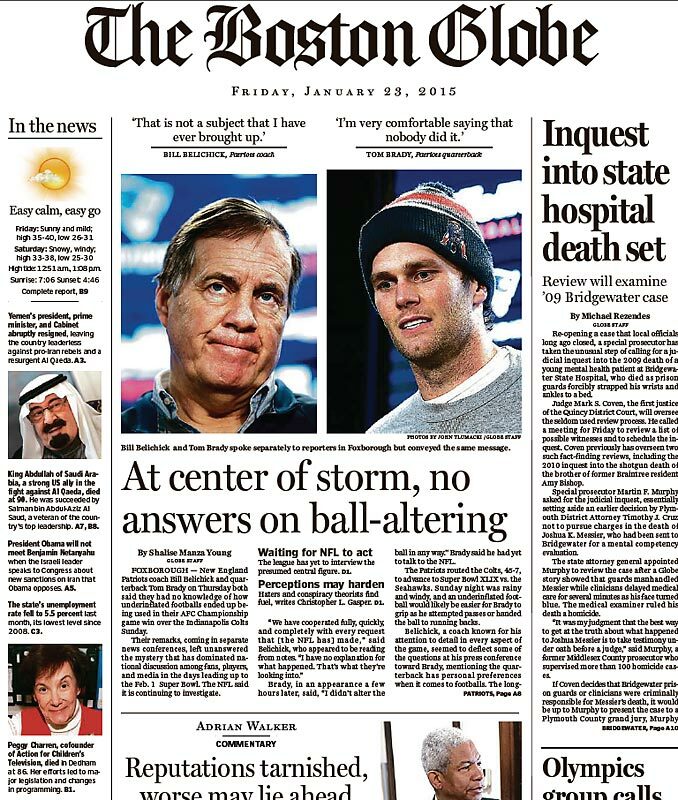 Mix one part controversy (allegations that the Patriots intentionally tampered with their game balls during their AFC Championship Game win over the Colts), one part rivalry (it involves a Boston sports team), one part absurdity (the repeated use of the word "balls" during Tom Brady’s press conference) and one part editorial creativity, and you have a formula for newspaper magic. 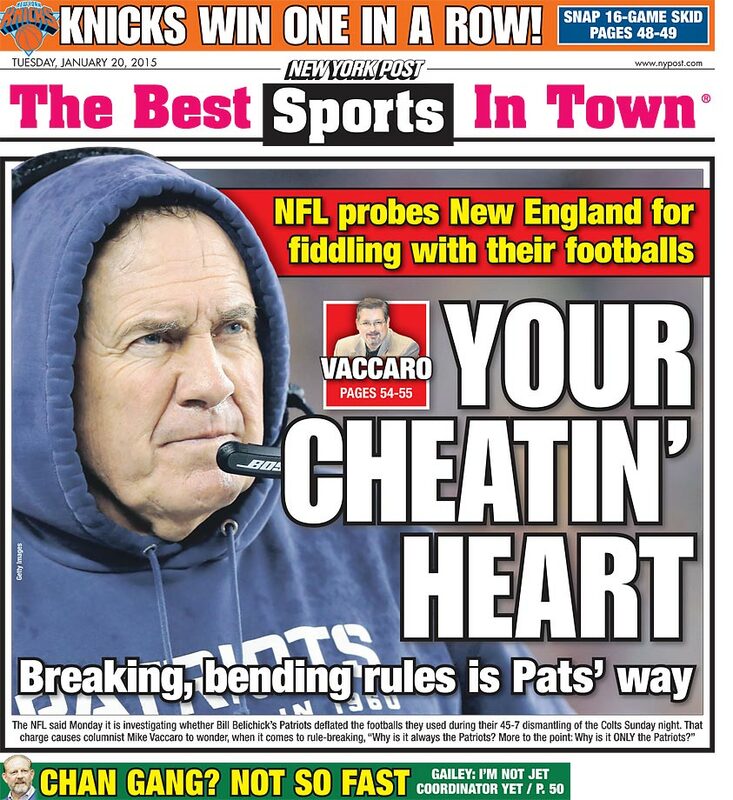 To wit: Here are the New York Daily News back page headlines over the last four days. Many tabloid newspapers refer to these eye-catching, pun-happy front and back page headlines as "the wood". Says Teri Thompson, the managing editor of sports for the New York Daily News and an award-winning investigative reporter, "It can be a noun or a verb. We’ll say 'We are going to wood with this,' or 'This is the wood.'" 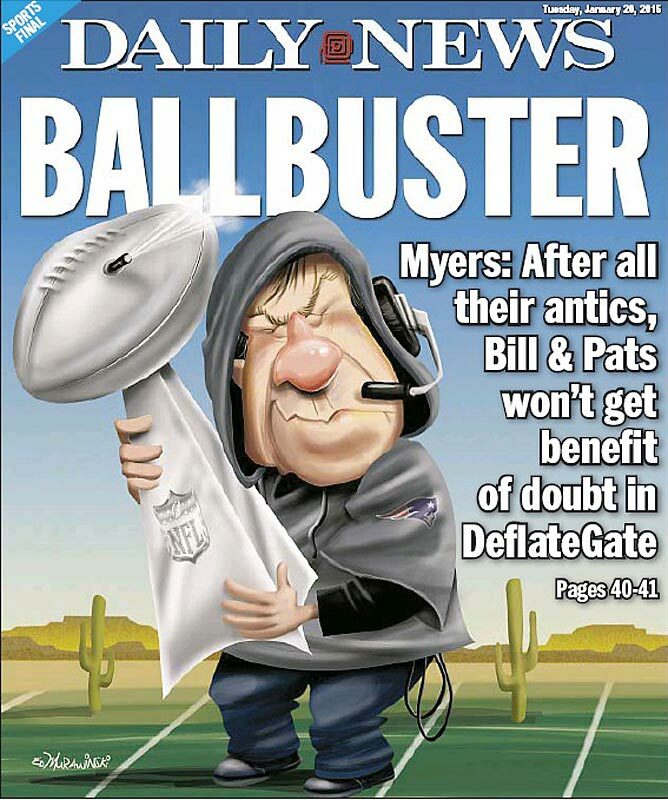 The wood has been fun this week for her paper, thanks to the Patriots. 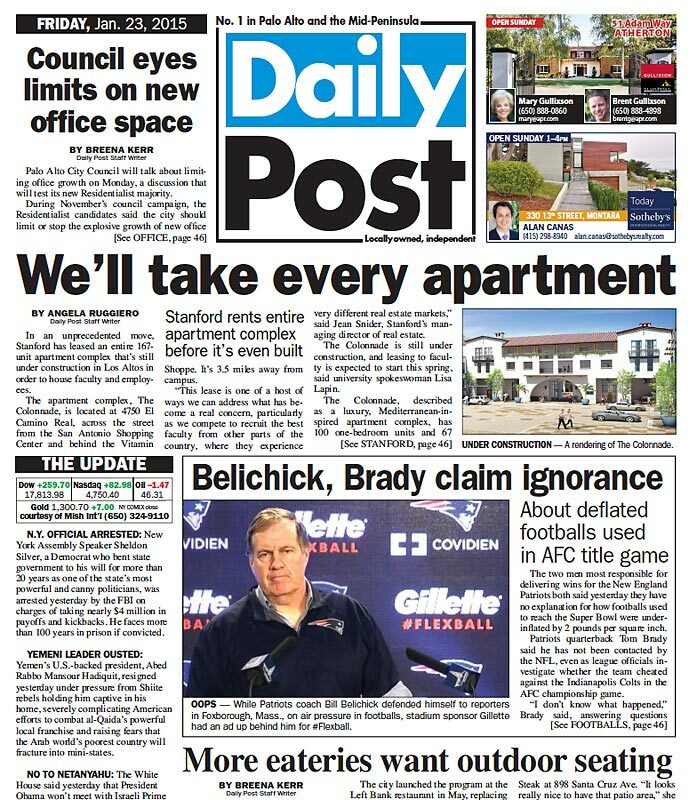 There are televisions throughout the sports department of the Daily News, and yesterday all of them were focused on the press conferences of Pats coach Bill Belichick and Brady. "Everyone was watching the press conference, and when Tom Brady says 'My balls are perfect,' you could hear the laughs at the desks," Thompson says. How does the wood get chosen each night? The process at the Daily News, Thompson says, is collaborative between editors, designers, even reporters sometimes making suggestions. 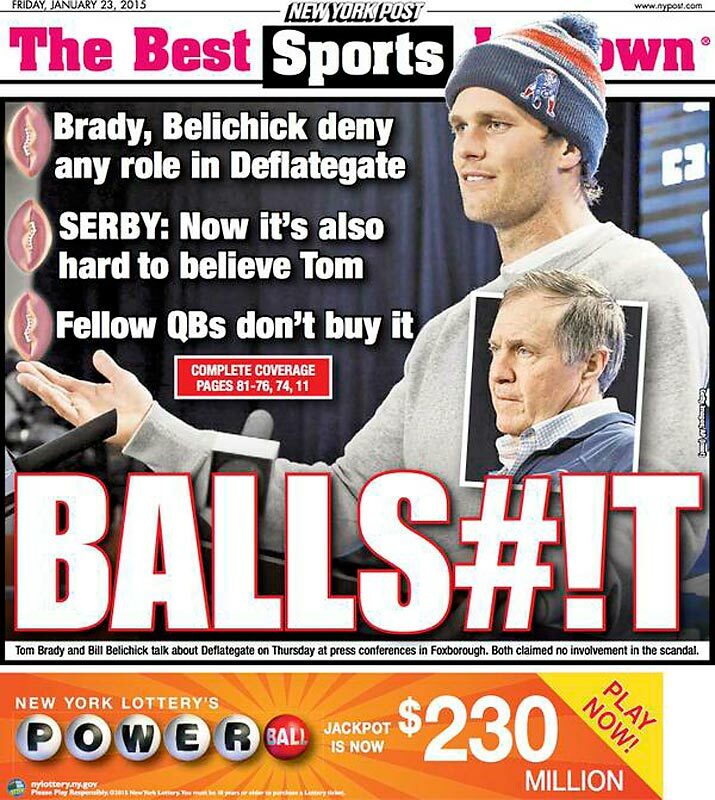 Initially, Thompson’s group came up with "GREAT BALLS OF LIAR" following the Brady news conference, but it was ultimately rejected. "We thought, well, you don’t want to condemn him [Brady] as a liar because we are not sure about that based on our reporting and the reporting out there," Thompson says. "So our sports editor Bill Price, who is a terrific headline writer, a great back page guy, went to work on other possibilities and designs for the page. Everyone will throw out something from the desk, and that includes the editors, the layout people, the copy editors, the website editors, any number of people. Sometimes the reporters make a suggestion, or even the news side does. You know it when you hear it." 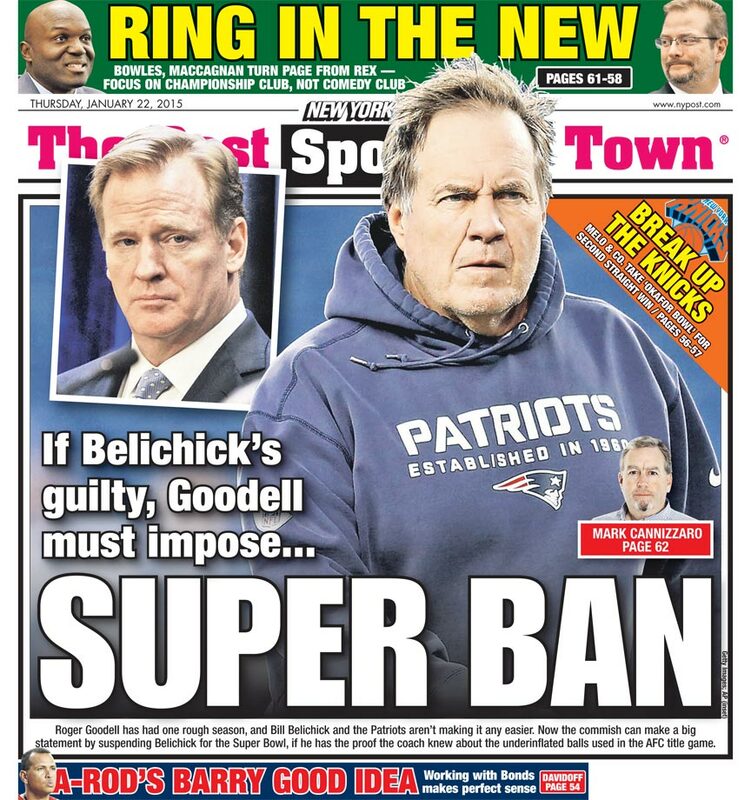 Given the Patriots' press conferences were easily the biggest sports story of Thursday, the Daily News completed its back page by about 8:00 p.m. On other nights, the decision can go late into the night. Thompson and the top editor of the paper, Colin Myler, will each see the back cover before it goes to press. 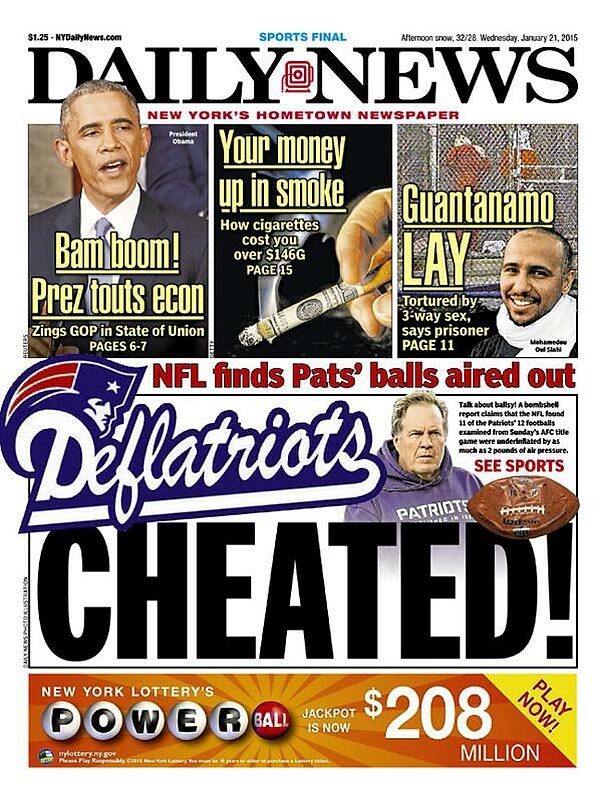 The front of the Daily News has also contributed to the fun this week, referring to the Patriots on Tuesday and Wednesday as the "Deflatriots". 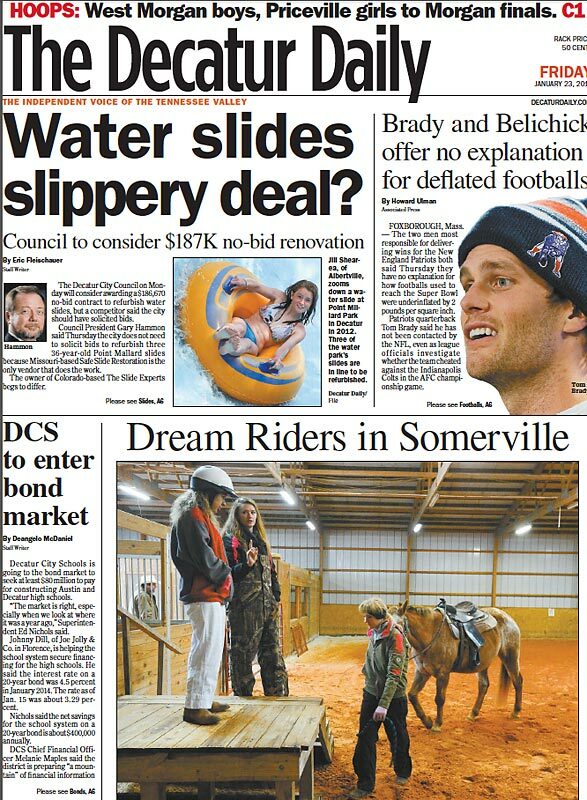 The sports department often collaborates with the front page editors if they are going with sports on the front. "In our afternoon meeting, if they hear a headline that they think is appropriate with the front, they will take it and then we have to come up with a different one," Thompson says. "The front page takes precedence." 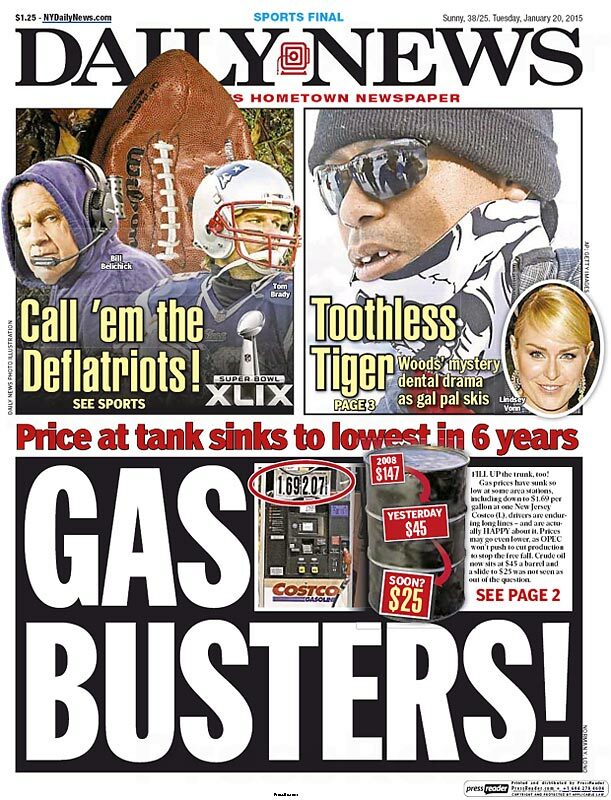 The Boston Herald has also been on its game. 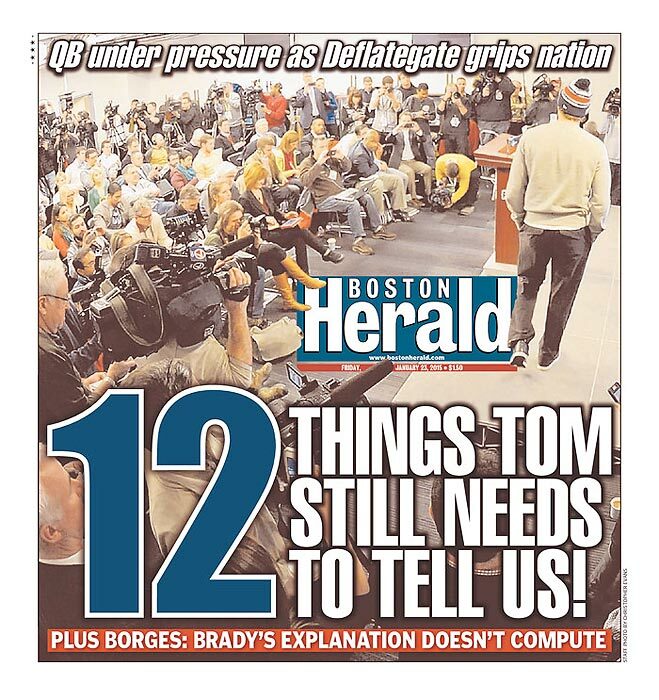 On Friday the tabloid's front page demanded "12 THINGS TOM STILL NEEDS TO TELL US!" 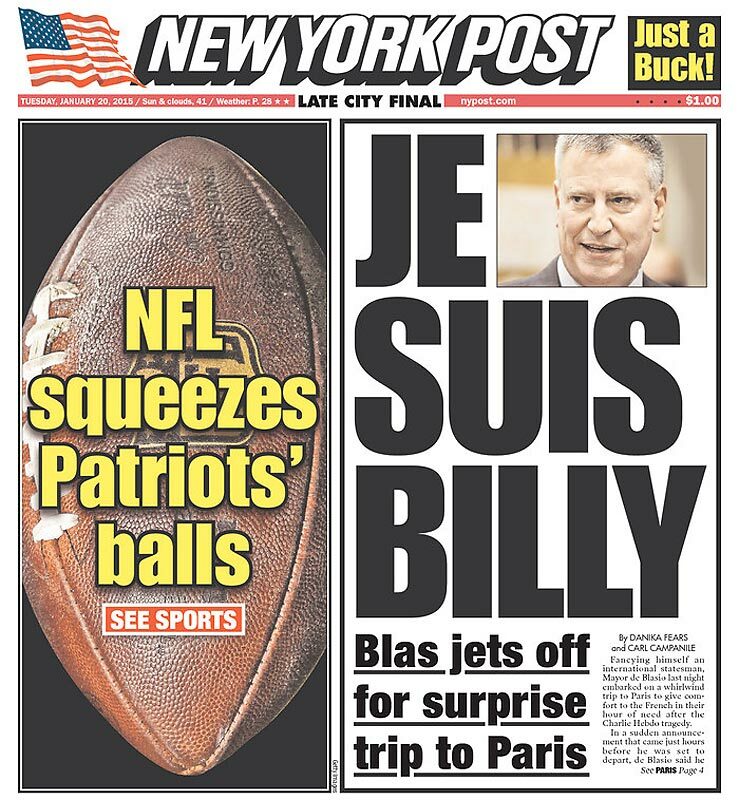 while the back page declared the ball was now in the NFL’s court with the wood "PROVE IT." "Every day they amaze me with their ability to convey in two or three words what it takes me 750 words to convey -- and often with a punch to the jaw," said Post sports columnist Mike Vaccaro. The Post has some legendary figures, including night editor Pat Hannigan, with many years of experiencing providing the wood for the back page. 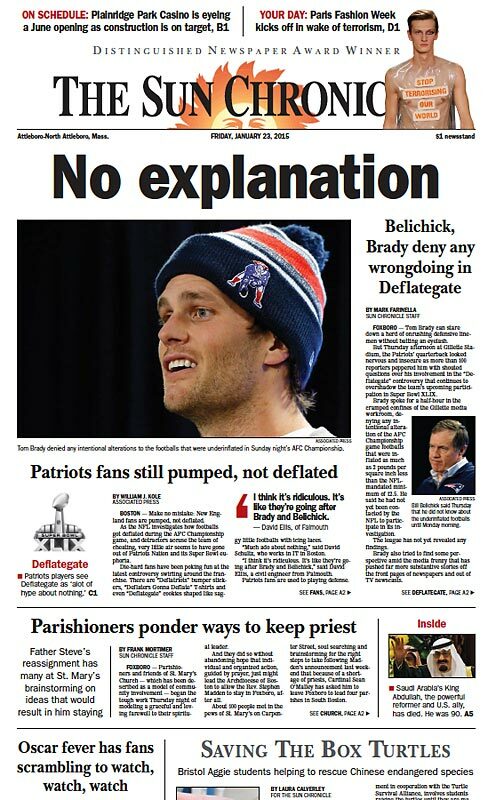 Vaccaro said he was fortunate once to suggest a headline -- "SAM: I AM" -- that made the first edition of the paper. That came when Michael Sam went public about his sexuality. ​Vaccaro is one of the writers who often has to deal in-person with the subject of one of the Post’s razor-cutting headlines. "I think all of us know the rules of engagement the day we sign on to the Post," he says. "We're loud and we lead with our chin (in our case, the back page), and honestly, that's a large part of the fun, from where I sit." Thompson, for one, enjoys the wood competition with her NYC tabloid rival. "We always think we have a better one," she says. "We grudgingly admit if they have a better one, but we never like to think that."